Science Exchange provides an online market for researchers to purchase the scientific services of specialized facilities. No human is an island, so why should research scientists be any different? YCombinator backed startup, Science Exchange, helps researchers hire the expertise, equipment, and labor of other scientists from around the world. Think of Science Exchange as a curated Yellow Pages for the scientific community, a carefully vetted eBay-like system through which scientists can pay one another to perform the exact area of research in which they excel. When Dr. X gets a big grant to perform a genome study, she can use some of her cash to purchase the sequencing services of Dr. Y, leaving her plenty of time to focus on the juicier genetic questions she wants to explore. Science Exchange is collaboration powered by the free market, and it might just be the future of science. Looking at Science Exchange’s limitations also gives some key insights into their success. 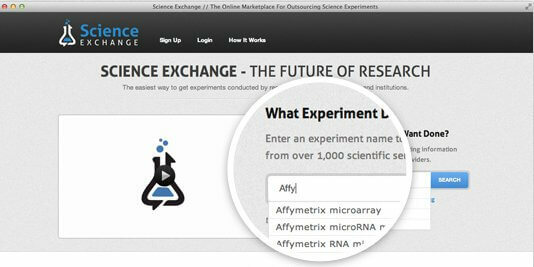 First, Science Exchange creates each service provider (facility) page manually. That means the startup has to spend time and money to verify the services offered, the availability, the pricing, etc. Of course, that also means that Science Exchange really knows what each facility can provide and how each service may be best paired up with their users. (To date, there are more than 1000 “core facilities” in the database.) Second, even with extensive search features and filters, when a researcher finds a provider they want to hire, they can’t simply click a button and order the work they need. Each transaction started on Science Exchange is really the beginning of a conversation between peers, with scientists on both sides discussing the needs and expectations for the work. However, that conversation really ensures that the work is a true scientific collaboration, albeit a paid one. Finally, Science Exchange is only going to be as comprehensive if both researchers and facilities find it attractive enough to join. To that end, it’s always free to browse, and free for providers to list their services. Knox and Iorns say that they are actively looking to expand their base of facilities (and researchers) in years ahead. Approximately 70% of the user base (facilities and buyers) of Science Exchange are in the United States, with about half the remainder in the EU, and strong presences in Australia and Asia. One of the big short term focuses of Science Exchange will be to expand the non-US numbers, transforming the startup into a truly global platform. If Science Exchange is successful in that endeavor, it seems very likely that the company will have a major disruptive influence on the scientific community, and that is thrilling. The modern research ecosystem is broken: research takes months (if not years) to be published by peer review journals, prestige and grant money is disproportionately given to the very few researchers who publish in the most exclusive journals, and this “winner take all” reality for grant money means that scientists are incentivized not to share or collaborate. Many different companies and agencies are trying to change this system. Open science advocates want to allow researchers to share papers outside of the journal system, as seen with the very successful Academia.edu. Other companies work to replace journal reputation with a more broad based community reputation through tracking comments or citations. Science Exchange is taking a third approach. By allowing researchers to easily outsource to other scientific experts and rate their experience, they are creating a sort of transactional peer review. Those scientists that receive the grant money spread it around by purchasing the expertise or equipment services of others. They also form de facto collaborations in the process. Reputation is tracked by both customer and provider satisfaction (yes, Science Exchange is concerned with provider satisfaction too). Where other organizations are trying to crack open the journal system to solve money distribution issues, Science Exchange is using money to solve some of the issues with the peer journal system. At least, that’s how I see it. 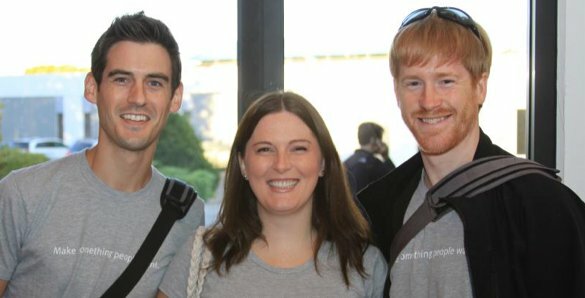 The Science Exchange Founders: (from left to right) Dan Knox, Elizabeth Iorns, and Ryan Abbott. Iorns and Knox certainly have their long term hopes for the company improving the way science is done, but you can tell they are still firmly focused on the short term. Expand the listing of providers, attract more researchers, continue with their globalization, provide an experience for all involved that is above reproach, save everyone money. They’ve got backing from YCombinator, at least another $1.5 million in invested capital, and a great deal of user satisfaction. With a beginning like this, Science Exchange is definitely going to grow quickly. As they do, they’ll likely become one of the new influences that help renovate the old way of funding science. In that future, every scientist will be a scientific service provider. Which, if you really think about it, they already are.